Hey friends! Today I’m teaming up with a bunch of other bloggers to each share our favorite things gift guide! I hope this helps as you get ready for Christmas with some gift ideas! Phone Accessories– Can anyone ever have too many lightning cables? Or since putting a pop socket on my phone it’s like I don’t know how to hold a phone without one I love this Leopard or Rose Gold one. Faux Plants (String of Pearls, Snake Plant, or Airplant)- One home can never have enough plants, and since I’m all about low maintenance ones these are all faux! Winter Gear Who doesn’t love to be warm and cozy? This Pom Pom Hat is my favorite. I actually purchased this hat as an early gift to myself and it’s amazing. I bought this scarf for myself last year and I get compliments every time I wear it. The cheetah print is a fun bold pop of pattern to add to my otherwise totally neutral wardrobe! These rain/snow shoes are my all time favorites. They’re waterproof and warm without being clunky when it’s not boot weather but also not nice enough for real shoes. Macrame (Runner, Wall Hanging, or Planter)- I have a bit of a macrame obsession and I feel like macrame is a gift anyone can appreciate! Cups & Mugs I’m sort of obsessed with these Yeti Ramblers, especially since they’re dishwasher safe AND can have a chug cap, mag slide, or straw lid! They also come in TONS of colors and work for hot or cold drinks. I also love these contigo mugs for my daily iced coffee. Books– I bought Homebody by Joanna Gaines as a gift, and couldn’t help but flip through the pages before gifting it! I also love the “Americas’s Test Kitchen Cookbook” and refer to it constantly. Games (Dutch Blitz, Codenames, and Tenzi)- We LOVE a good game night and these are three of our faves. I’ll be gifting all three to our friends and family because I want everyone to love them as much as we do! Socks are on my list every year and they never get old. These smartwools, these ones, and these ones are my very favorites! Music– This JohnnySwim CD is my all time favorite and I listen to it daily! I also can never get enough NeedtoBreathe, Stevie Wonder, or Imagine Dragons. Coolers– This summer we brought this soft sided cooler on our cross-country road trip and it was perfect. It’s so much easier to carry than a typical hard sided cooler and was easier to pack too! For times when a large hard cooler is a necessity I’ve got this one on my wishlist! Lastly I would love one of these backpack coolers for picnics and day trips. I can especially see it being great for when we pack meals to bring skiing. DIY tools– A good tape measure, a good paintbrush, and a nice drill are MUST haves for anyone tackling any DIY projects. Home Decor– A nice Welcome Mat, a beautiful Throw Pillow and a cozy throw blanket are my favorites for every home. Thanks so much for stopping by and checking out my favorite things! Make sure you check out the other blogs in this roundup for some great gift ideas! Thank you so much to my friend Jenny from Evolution of Style for hosting this hop! 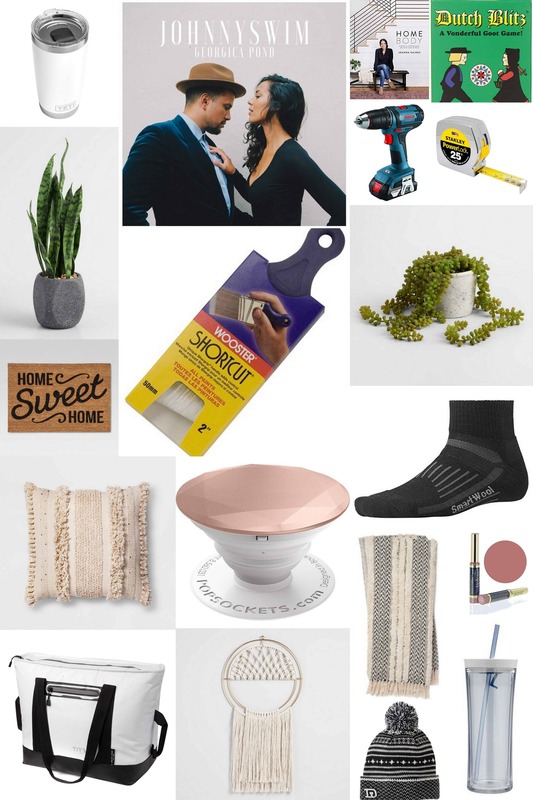 Also be sure to head over to my full gift guide to see gift ideas for ladies, guys, boys, girls, DIY’ers, Readers, and Techies! I love all these awesome gift ideas! Going through all these links definitely makes picking gifts easy. I’m with you! How did I do it without a Pop Socket before?? And yes to all the socks! I’m the one that’s always cold so these would be perfect! Right?! Also no one could ever be sad about receiving a nice pair of socks! The perfect gift!